I usually have to work on Bank Holidays (drags of the retail industry), so when a rare day off occurs I usually like to stay at home, snuggled up with chocolate and DVDs. But this time me and my boyfriend wanted a day out, enjoy the day and get some fresh air. 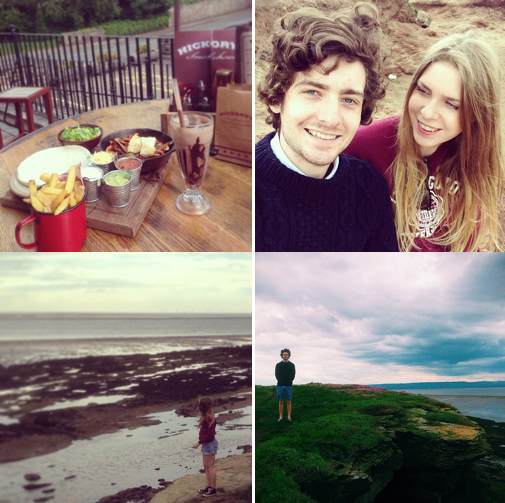 We visited Hilbre Island, just off the Wirral, and enjoyed a long walk along the beach, collecting shells and finishing the day at one of our favourite restaurants : Hickory's. I had veggie fajitas with halloumi - which were out of this world! And a chocolate milkshake (as always). If you visit Hilbre Island, be sure to check the tidal times online before you go, you can only visit at certain times during the day (obviously when the tide is out) and this is one island you DON'T want to get marooned on! No food, no loos, no nothing! I am one of your subscribers, I didn't realize that you're also keeping a blog, that's great! Thank you SO much for your really lovely comment :) You've absolutely made my day!